Description: Enola's landlady, Mrs. Tupper, is the closest thing Enola has to family these days, besides her occasional run-ins with her brother Sherlock. Even though Mrs. Tupper is nearly deaf and can barely cook, she's an endearing presence as Enola longs for her absent mother. So imagine her horror when Enola comes home to find Mrs. Tupper kidnapped! Who would take her, and why? And what does Florence Nightingale have to do with it? 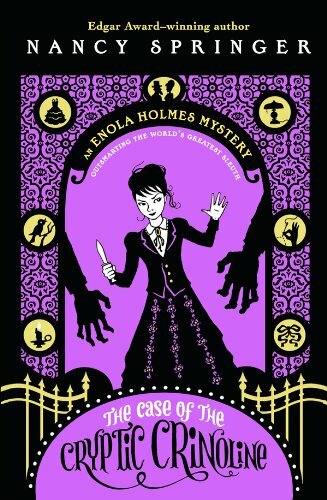 From the master of mystery Nancy Springer, here's another absorbing adventure for our award-winning, unstoppable heroine, Enola Holmes. My Thoughts: Enola finds herself in the middle of a new case when her landlady is kidnapped. Mrs. Tupper is deaf and is a horrible cook but she is the nearest thing Enola has in the way of family now that her mother has disappeared and her brothers are too eager to plan her life for her to want to have anything to do with them. The seeds of this mystery were sown during the Crimean War when Mrs. Tupper was there with her husband who was selling things to the soldiers. Her husband caught one of the many illnesses rampant in the area and was in a hospital where Florence Nightingale was nursing. After her husband's death, Miss Nightingale arranged for Mrs. Tupper to return to England. Now someone is quite interested in something that Mrs. Tupper inadvertently carried back home with her. Enola has to discover what Mrs. Tupper had, contact Florence Nightingale, discover her missing landlady and stay away from her brother Sherlock who is also on the case. This was another excellent middle grade mystery with codes, disguises, daring deeds and all sorts of adventure set in Victorian England. A shock of revelation appropriately electric in nature coursed through me, jolting me to a halt. "Ye gods in holy stockings,"I cried out loud. "Morse code."